Framed piece: “Discus” by Goran Konjevod now live! The piece, framed in a 10in x 10in x 2in glass-less frame, was folded in 2009 from a 13-inch square of “elephant hide” paper. If buying Origami Art isn’t your thing, then you could of course always donate to the project directly via PayPal – there’s a link in the sidebar at right. The piece is a life-sized Rose, folded by the master of roses himself. Both Rose and Leaves are folded from “Tant” paper, a medium-weight paper with a very slight texture. First auction – “Cartoon Frog” is now live! Our first auction item is this cheerful Cartoon Frog by Nicolas Terry. We’ll open the auction at 8 PM EDT (US) on October 25, 2011. During this year’s World Origami Days celebration, from 24 Oct. to 11 Nov., we will be auctioning off original origami artwork (via eBay), donated by the artists themselves, in support of the project. Most auctions will last just one day, so don’t miss out! And if you don’t want to bid, you can always contribute directly to the project via a direct donation – use the “Pay Now” button, right, to donate with PayPal. 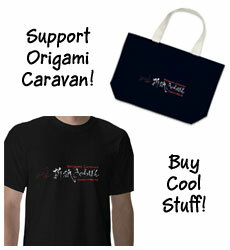 We’ll also be selling Origami Caravan t-shirts and similar merchandise; we’ll post when the storefront is ready. We'll be holding our second auction starting 5 May, 2012. Good luck, and thanks for your support!